Guests at your wedding will appreciate a favor they can actually enjoy or use. 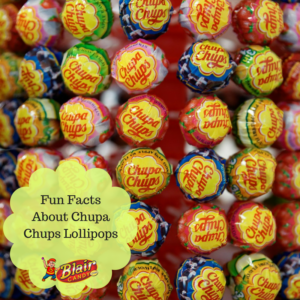 Candy makes for a wonderful treat for anyone attending your special day. Display it as part of a candy bouquet, create candy favor bags, or put out bowls of wedding candy on each table for guests to nibble on – there are just so many ways to incorporate candy into your wedding plans! Shop by Candy Color: Match your candies to your table linens, bridesmaid dresses, flowers, or other wedding decor. Shop for Wedding Candy Buffet Candy: Outfit your candy buffet for guests with ease by choosing sweets from this selection. 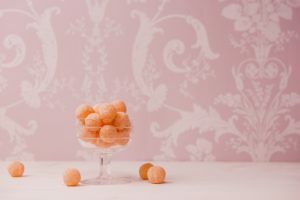 Shop for Nostalgic Candy: If your wedding has a retro-theme that you want to get guests into, consider serving up nostalgic wedding candy favorites. 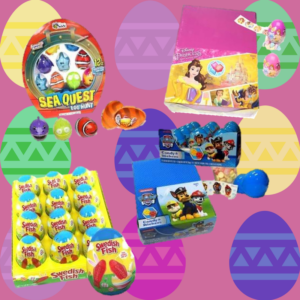 We carry a wide variety of candy options to fit any occasion, so shop by the themes above or choose your and your future spouse’s favorites to adorn your tables or fill your favor bags! 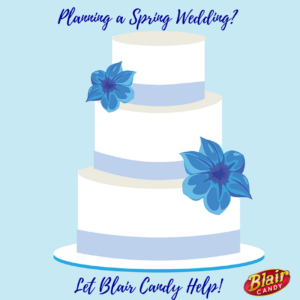 Your special day is all about celebrating the sweetness of love and what better way to make your shower a little bit sweeter than with wedding candy? Wedding-themed candies can be a delicious way to add some color to your shower tables. Plus, they make for a sweet treat for your guests. 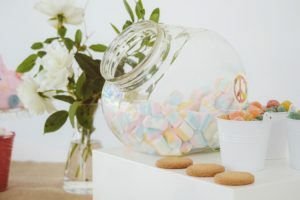 Colorful Candy Jars: There’s something about glass canisters filled to the brim with candies that makes you feel like a kid again. Choose wedding candy to match your wedding colors and then fill several glass jars with them to place in the center of your tables. Choose jars of varying heights and sizes for a whimsical touch. Candy Bouquets: If you’re feeling crafty, turn wedding candy into a bouquet by using non-toxic adhesive to fasten candies by the wrapper onto wooden dowels in fun flower shapes! Or, if you want something that’s even more edible, unwrap the candies and use a cake maker’s adhesive, which is completely edible. There are tons of tutorials out there to help you make a wedding candy bouquet using tissue paper, a mix of fresh or artificial flowers, or other ingredients! Place your bouquet into a vase and enjoy. Lollipop Trees: Decorate a clay flower pot and use floral foam to create a base for your lollipop tree. Then, use a wooden dowel or decorative rod to make for the “trunk”. At the top of the dowell, place a round, foam flower ball. Stick individual lollipops into the flower ball – you can make patterns, alternate colors, add bows or rhinestones, and so much more! After the shower ends, encourage your guests to fill up their goodie bags with the decorations as a sweet favor! 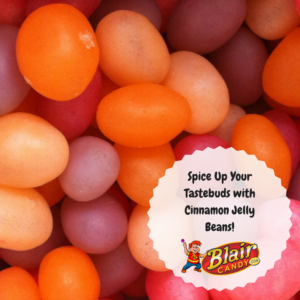 Spice Up Your Tastebuds with Cinnamon Jelly Beans! Jelly beans are one of our absolute favorite movie treats. When you settle in with a big bowl of popcorn, it’s nice to compliment the crunch with something sweet. 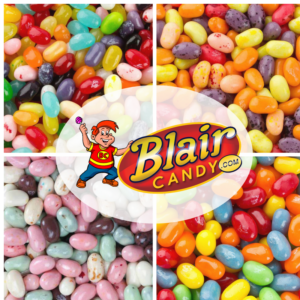 At Blair Candy, we carry a huge selection of jelly beans to wow anyone on movie night. From cinnamon jelly beans to fruity flavors you’ve come to love since childhood, you can find just about any jelly bean to satisfy your craving! If you’re looking for a flavorful and unexpected treat, whip up a batch of our marshmallow jelly bean popcorn. It’s a real crowd pleaser that will delight everyone joining you for the film – even if they’re not a big movie fan! Start by popping 10 cups of popcorn (use an air popper or any other popping method you prefer) and placing it into a large bowl. Add a bit of salt. Then, in a medium saucepan over medium-low heat, melt 3 tablespoons of butter and add 3 cups of mini marshmallows. Stir until the marshmallows have melted. Turn off the heat and pour ¾ of the marshmallow over the popcorn, folding together gently until the popcorn has been coated. Pour the popcorn onto a prepared cookie sheet and drizzle with the remaining marshmallow mixture. Sprinkle on a handful of jelly beans (we love spicy cinnamon jelly beans for a little kick!) and allow for the popcorn to cool. Break apart to serve and enjoy! 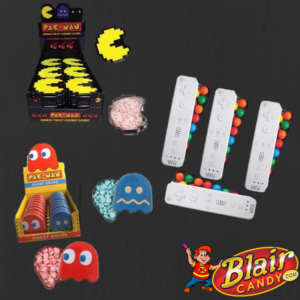 Shop all jelly beans, movie candy and more at BlairCandy.com today! What Can You Do With a Bag of Bulk Jelly Beans? What is your favorite flavor of jelly bean? If you can’t choose a favorite and love jelly beans, then you’ll have to get one of these ten-pound bags of Jelly Belly beans! You can choose from a bag of sour flavors, smoothie fruit flavors, classic flavors, or even Cold Stone ice cream flavors. But what else can you do with jelly beans besides eat them by the handful? Crafts: There are tons of crafts you can make with jelly beans! A popular craft, especially with kids, is jelly bean bracelets and necklaces. Also, there are plenty of ways to use jelly beans and candy in festive floral arrangements. See how to make the jelly bean jewelry here on the Mom Luck Blog and the floral arrangements on the Home is Where the Boat Is here. Learning Activities for Kids: Aside from crafting, there are “science” experiments that you can do with jelly beans. Also, basic math, counting, and sorting activities are made more fun with jelly beans. For more information on the science experiments, see the blog Little Bins for Little Hands here. Recipes: Obviously, you can put jelly beans into your favorite dessert recipes! From cookies to cupcakes, there are plenty of recipes that you can make with your any flavor of jelly beans. Check out 20 recipes that will satisfy any taste buds on the Shopper Strategy blog here. Get your bag of bulk jelly beans today and get to crafting, learning, or cooking! 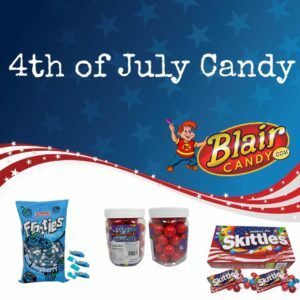 Find plenty of jelly beans, gifts, and more at BlairCandy.com. Have You Tried Our New Imported Candy Bars? Mars Bar: These are pretty different than the US Version. Packed with caramel and fluffy chocolate filling, these bars are out of this world. Need another idea of what these bars are like? These are pretty similar to a US Milky Way bar. 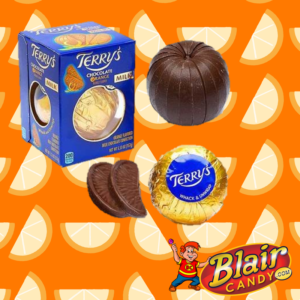 Terry’s Milk Chocolate Orange (pictured): What two flavors seem like they wouldn’t be good together but actually are a winning combination? Orange and Chocolate! These have individual slices of orange and chocolate, perfect for sharing. Milka Bar: If you want smooth, melt in your mouth chocolate, you have to have a Milka Bar. These chocolate bars are made with 100% alpine milk making them super creamy. We have three flavors, so you’ll have to try all three and see which your favorite is! These are only a few of the imported candy bars we have on BlairCandy.com! Try them today for a quick vacation without leaving home.